It seems like only yesterday that American announced a new $25 fee for checking a second bag (actually, it was just a few weeks ago, and that rule took effect May 12). Back then, I said, “Well folks, it’s all over but the crying,” but oh, how horribly wrong I was. American also revealed plans to cut fourth quarter capacity by 11 to 12 percent year over year, and retire roughly 75 mainline and regional aircraft, all moves aimed at balancing the carrier’s costs and revenues. 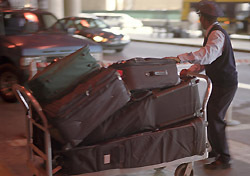 The new baggage fee came as a surprise to all of us here at SmarterTravel.com, and will almost certainly have far-reaching ramifications throughout the airline industry. When Spirit Airlines issued a similar policy, we all groaned, but like it or not, the move was more or less in line with Spirit’s low-cost, a-la-carte business model. American, however, is the world’s largest airline (for now), a legacy carrier in the truest sense. Its decision to charge for all checked bags sets a startling precedent for other legacy airlines that, like American, have traditionally offered these basic services free of charge. But let’s face it—the decision isn’t a total shock. The air travel industry has been moving toward pay-as-you-go pricing for some time, adding charges for everything from onboard meals to window seats. Still, I doubt many people ever thought this approach would extend to one of the most fundamental aspects of flying. The true meaning of this move will be revealed in the coming weeks, as American’s competitors contemplate similar policies of their own (good news already: Delta will pass). Look for continued coverage here in Today in Travel, and check our roundup of airline fees to see who’s charging what. And as always, we’d love to hear what you think, so leave us a comment below. For some additional perspective on this news, read Thursday’s blog entry.